Working as a Philips Certified Value Added Partner takes us to many exciting parts of the lighting world and the new technologies that are being developed. We are now seeing many leads coming in from our fantastic list of clients regarding the Luminous Innovations that Philips Lighting are developing. Seamless integration of LED lighting in carpet creates experiences which are inspiring, comfortable and aesthetically pleasing. One simple installation gives you infinite ways to make an impression. Touch your tablet, and lights under your feet brightly display graphics and words. Touch your smartphone, and dynamic moving images show a personal welcome to your expected guest. Your floor becomes a tool for informing and inspiring people. Greet and guide hotel guests, making them feel welcome Go hand in hand with the aesthetics of your building, with high-quality carpet material that looks good even when the lights are off. Smart technology that brings your brightest ideas to life. Luminous Carpets combine Philips LED technology with resilient but luxurious looking Desso carpet. The result is a durable, stylish flooring solution that you can use to greet, impress and inform people in new and exciting ways. The solution has been designed to fit seamlessly into your building architecture without disrupting essential processes, like cleaning. Cutting-edge LEDs are built into strong units that also protect the lights from any spilt fluids. These are combined with high quality carpets, specially developed for the purpose. 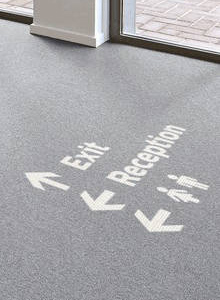 With a little guidance Luminous Carpets can be easily installed into your floor and connected to your electrical and IT infrastructure. They then sync with your building management system and run pre-programmed light displays. Alternatively, you can change the lights on-demand from tablet and any other networked devices. Powercor is here to help – Call us on 01932 839 890 with any queries you may have. We can design, install and commission in-house and work closely with you to find the best solution for your needs and being a Certified Value Added Partner, we can offer incredible prices for any application. Richard Grace jointly established Powercor in 1998 and is currently the Managing Director. He is an extremely motivated individual, is highly driven, a loyal servant to the electrical industry and has the will and commitment to succeed in all aspects of work and life. He enjoys being a husband to a beautiful wife and father to two glorious boys. He thinks he is a fine wine connoisseur, loves eating copious amounts of food, watches all sports and believes there is nothing as good as hacking up stunning golf courses.